You have probably seen the following scenario in multiple thriller and spy movies; A spy connects an USB stick to a computer to copy data from the computer to the device. Movies do not necessarily reflect reality but there is some truth to this scenario after all. It is indeed possible to connect an USB device to a computer running Windows to copy data from that computer to the removable storage device. It is sometimes in the best interest of companies, organizations and individuals to protect the data on their computer from being copied this way. Microsoft has added options to the Windows operating system (more precisely to Windows XP and newer operating systems) to write protect all USB devices that are connected to it. This indicates that it may not always be possible to protect the computer this way, for instance if data needs to be written to USB devices regularly. Write Protection adds another layer of defense to the computer. The system is not fool proof on its own, as it is still possible to copy data, for instance by uploading it to the Internet or a network connection. You can enable or disable write protection of all USB devices that are connected to the Windows operating system. Both settings are configured in the Windows Registry. Here is how this is done. Open the Windows Registry editor with the shortcut Windows-r, enter regedit into the form and press the return key on the keyboard. Please note that you may need to create the key StorageDevicePolicies if it does not exist. Select the key afterwards and right-click into the right window. Select New > Dword (32-bit) Value from the context menu and name the entry WriteProtect. Double-click the new entry afterwards and change the value from 0 to 1. A value of 1 disables writing to all connected USB devices. If you want to enable writing again you need to change the value of the key to 0. The new setting takes effect immediately. Every user who tries to copy data to USB devices with write protection enabled receives the following notification window. Remove the write-protection or use another disk. This way you can disable write protection with a click on a file, and enable it again when you have copied files to the USB device. Find out how you can enable the write protection of USB devices when using a Windows PC. even though it does not have a switch for write protected and unprotected. i tried to fiz the registry, the device manager, but it has no effect. i tried transcend online format but it says that no flash drive detected. I tried this to disable write protection on my flash drive but it didn’t work. I followed all your instructions here, yet it didn’t work. What do I do next? Tried this but any little USB flash stick still says I need permission to write to it. Windows 7 Pro. Used to work and now simply doesn’t. No AV or firewall (both off) and works fine on old Vista laptop. DiskPart did nothing. Formatted to NTFS so I could take ownership. Doesn’t matter. I have no permission to any USB device I put in the USB port. I cant find “StorageDevicePolicies”…im using xp 2005. any one ? does it really matter that you’re a 47 year old female ? Sorry for how you struggled in that process. This is how people struggle to seek true salvation which is found through Jesus Christ Only. Congratulation for being able to seek for help. Cheer up Mom. As you struggle in solving the problem of USB, please do not forget to seek true Salvation in Jesus Christ. Be blessed.Rev Yusufu from Tanzania. Unhappily you are going to find no salvation in the one does not exist. As Kenyata said “when british arrived to Kenya with their bibles, we had the lands. Now we have the bible … and they are the lands OWNERS!!! “Storage” and “Storage Device Policies” are the same bro…. I have tried to remove the write protection using windows and its not working? what next? It worked in my office pc where writing to usb stick was disabled. I have 4 GB Sony pen drive usb 2.0. I try to open getting pop msg–> Do you want to formate. After formate again getting msg like –> The operation did not complete because the media WRITE PROTECTED. I try from Manage–> Disk Management also –> windows not succesfull formate… Its very challenging to us. could you plz help me on this. Thank you so much! DiskPart worked whereas the registry mods didn’t. I think the problem is due to virus infection. If you tried all the above without success, just throw it away. peoples, you can resolve this if you put a windows cd-rom and put to format the Hard-Drive, in the list of hard drive you select the pen-drive write protec and format him, only format, dont instal nothing, or you can put to put windows in the usb and in the middle of instalation put out the usb, this will cause a corrupt usb, in a RAW format, now in the windows, enter in disk management and create a new simple volume ! its easy !! hugs ! May i know how to go to window registry? I’ve just bought a new 8 GB pendrive, it works fine for the past 1 week. However, it’s write protected now. I couldn’t delete files in the pendrive nor copy new files into it. I couldn’t format the disk too. I’ve downloaded UFIX, however, i couldn’t execute the disk in control disk. Please help to recover my pendrive, suggestion highly appreciated. nothing happen after i tried all the trick..please help me. The Registry will not allow me to change the value from 1 to 0. I tried to do this via Group Policy which is how this has been implemented but it sill does not allow the read only registry section to be modified. Hence only read access to any USB device is permitted as per policy. Thnx alott guys……………….it worked 4 me………………! i just stole this Skyblue 8gb usb but its write protected…cant solve using u rec. help…..
storage dive policies option is not available. My new 16GB sandisk pendrive is having write protected problem. 3. Tested for sample file, it could be written. p.s. I had to do this 2, 3 time to work out. Thanks a lot! Worked perfectly when I changed the value! strong stuff man,strong stuff,works perfectly!!!! my mobile memory card (transcend 2GB) is write protected and i cant able to copy anything to it. I am using samsung mobile. I have checked many of the samsung users, all of their memory cards are write protected. Please provide me the solution to remove write protection. I have a SanDisk Flash and it has this problem too. but when I tried to unprotect as remembered above and also through StorageDevicePolicies . it is not worked so pleas help me. Tried your enable / disable ….. didn’t work. hello i cant find storage device policies in that box and i am facing still rite protection .how can i remove this from my sd card slot.i am using widows seven 64 bit operating system.pls can any one help me. please help me for same problem of pendrive.how to remove the write protection in pendrive. Can’t thank you enough. This works great!! Hello, Is there any solutions aside from the registry. it didn’t fix on me. 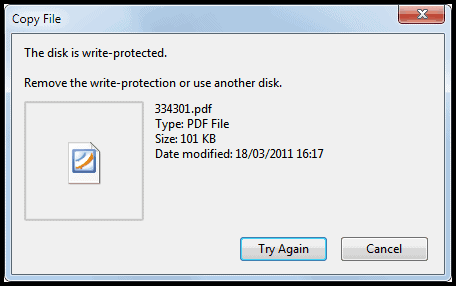 I’ve changed the “WriteProtect” value to “0” … but I still cannot copy file to my USb drive. I used the same USB on other laptops, and I can copy. This work for me, after I tried almost everything ! Thanks for the info……it saved my 32 gb sandisk ultra pendrive…….YOU ROCK MAN !!!!! For Enable and Disable USB Port its worked for me. Thanks! It worked for me. i have a pen drive, and it is write protected. I am try to disable the write protected. but i couldn’t find StorageDevicePolicies in Registry Editor. but there is not StorageDevicePolicies. please tell me any other idea to remove write protected. thanks..this is working fine for me as well..
Are users where this isn’t working granted administrative permission’s? If you don’t have permission from IT you can not modify the registry. I think you have to sign in as administrator to do these tasks. You may see one operating system but actually be on an IT controlled Server without permission s granted. Group permissions might be affected if that is your access level. I will try this to make it harder to be hacked on SD, USB. Anyone know how to recover hd partitions when the format changed, my portable was working between xp win7 computers but not so between vista with 7. Forget it mate… disk write-protection is ON the drive’s EPROM, not in the windows registry so this shouldn’t work. I used both 1) Cmd prompt way and 2) Your enable/disable trick also. It doesn’t work. 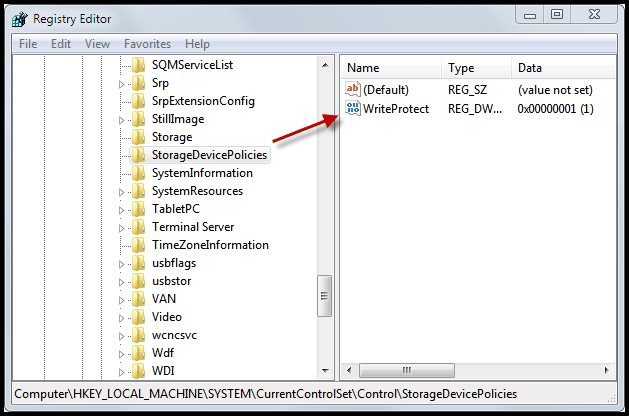 My kingstone pendrive still show “device is write protected” pop-up window.. Plzz help me to sort out this probllem.. The solutions provided here are of no use. You take this drive to another PC and and it is open to anything you want. What is required is a hardware solution such that it is protected or unprotected on absolutely any PC. What you are doing is just enabling or disabling the particular copy of Windows. hi i have a flash drive that i bought with a software, now that i am done with that software i need to format it to use for other purposes but its write protected. I have attempted all the methods above but nothing seems to get rid of write protect. Any idea guys are welcome. Help a bother. I had same problem with trancend jetflash pendrive.. Solution for that try to search for trancend jetflash online recovery tool… It restore pendrive in factory settings… Your welcome.